Find and book cheap holiday accommodation, flights and transfers in holiday resorts throughout Europe. 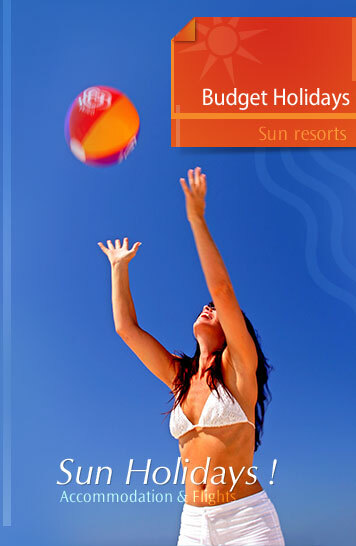 These budget holiday bookings are made with an ATOL (flights) and ABTA bonded travel company. Holidays, flights and transfers listed are provided in association with Alpharooms which is a large UK based travel companythat offers great value holiday deals. The company employs over 100 people and offers over 30,000 hotels and apartments throughout Europe! The company is trading for over 10 years and is ATOL (flights) and ABTA bonded for your peace of mind. Wide selection of low cost accommodation. We offer you access to thousands of hotels and apartments in all of the main European resorts and our website gives you access to a wide choice of cheap , quality accommodation which is available to book instantly. 100% secure payments and low accommodation rates. Credit card payments use industry-standard SSL encryption to ensure your payment details are secure. When you send your sensitive information to this supplier (such as credit card details) it is encrypted so that only the hotel booking supplier can read it.